Citizens Against Equine Slaughter hasn't added a story. Our fundraiser is to cover costs for the Occupy Salem event. Salem, Oregon September 25, 2015 — We will be meeting on the Capitol Mall across from the Oregon Capitol Building in Salem, Oregon at noon. This is the next step in our fight for American wild horses. In a phone conference with Tara Thissell from Burns District office, Oregon BLM, Ms Thissell stated to me that the approval for the Kiger/Riddle roundup was given because there is a PRIVATE MARKET for these horses. That they are auctioned off to the highest pre-approved bidder, that private breeders can and do showcase their horses (Kiger's) at this publicly funded auction and that they do allow vendors to sell stuff at the auction as well. She stated this is NOT selling our horses because there is no bill of sale given or title handed to buyers! 1. We want the Kiger's released back onto their range. 2. We want better management of the wild horse herds in Oregon, this can set a model for the rest of the states with wild horse and burro herds. This would include stopping helicopter round-ups. 3. We want BLM to follow the NAS (National Academy of Science) recommendation for using PZP as a way to control herd population and size. 4. We want BLM to follow NAS recommendation for genetic viability in herds. 5. We want a review of all grazing permits on HMA's where wild horses and burros are. When range conditions, drought or any other situation call for a decrease in wild horses or burros we want the grazing permits decreased proportionately. 6. We want regulations put in place for drought or extreme fire hazard conditions to supply water and make sure fences are removed allowing wildlife a path to escape in the event of fire. 7. We want the public to be allowed to view all round-ups. 8. We want written regulations that NO wild horse will be 'adopted' or sold for breeding purposes, which means stallions will be gelded! 9. We want the Kiger Khrome auction event to be an "adoption" event as done for any other herd. 10. We want in writing that no horse from our wild herds will EVER be in an auction being sold to the highest bidder, even if the BLM calls this an adoption! 11. We want, in writing the agreement for, consistency in the management of herds. 12. We want BLM to stop promoting breeders. 13. 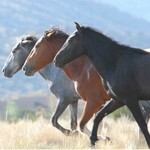 We want the BLM to come into compliance with the 1971 Free Roaming Wild Horse and Burro Act. Citizens Against Equine Slaughter hasn't posted any updates yet. Citizens Against Equine Slaughter is managing the funds for this campaign.